Airports could become the next powerhouses for renewable energy production says a new report from the U.S.. Department of Agriculture. The study looked at land-use within airports and determined that much of the land within the boundaries of an airport go unused. These plots of unused land are often a burden to airports as they require periodic maintenance (trimming fields) and constant monitoring for wild animals. Instead, the report suggested that these large tracts of unused land could be converted to areas of alternative energy production. Some of the forms of alternative energy proposed included crops for biofuels, solar panels, and wind energy. Not only would this create additional opportunities for clean energy production, it would provide the airport with an extra source of revenue. Furthermore, it would serve as a deterrent for wildlife from entering the airport, thus reducing wildlife related hazards. This latter point is particularly important since land managers outside of airports are ever-cautious about the impacts of renewable energy on animal-life. For instance, the presence of a wind farm can be a hazard to birds that might fly through a spinning wind turbine. 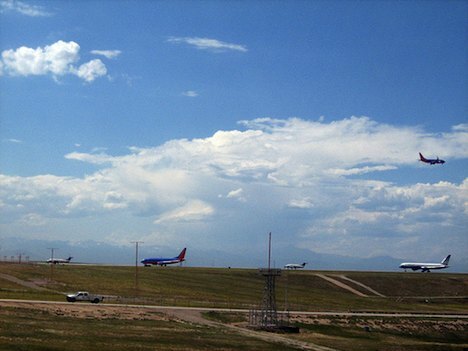 Alternative projects are already underway at airports in Indianapolis, Denver, and a number of smaller ones. Researchers and airport managers are eagerly awaiting the results from these early projects to determine their transferability to other airports. If these projects are successful, we could be seeing more airports converting unused land to alternative energy sources in the near future. Don’t airports have large open grounds for a reason? Or should we assume that aircraft performance is now such that we can do away with the big safety areas? As well as the threat to the generating facilities from aircraft, what about the threat to aircraft? Solar – PV or condensing – offers up big reflecting surfaces, wind generates air turbulence during critical flight operations. Passive, matt pipes for heating might work, I admit. Perhaps they are looking at any extra land well outside the safety areas. I doubt whether they’d even consider such a proposal otherwise. Although, with many airports being privatised, they’re always looking for new revenue. safety and noise issues. Obstructions around airports like wind mills, thermal plumes from turbine generators, and glare from reflective solar tiles are not compatible with airports. We are experiencing this very issue in California now.